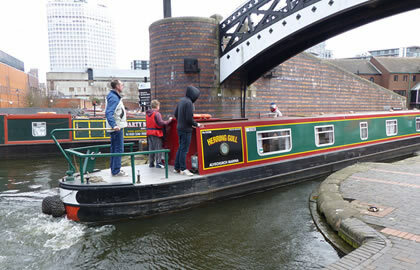 The Birmingham Mini Ring allows time to visit Cadbury World and then into Birmingham's colourful Gas Street Basin with all the canalboats and old Canal wharves. Visit the Sea Life Centre and the Bullring- full of every shop you can imagine, and the cruise allows a visit to the Black Country Museum which needs a whole day to really appreciate as it is based on 26 acres . Once setting off from Alvechurch, you soon leave the traffic behind and cruise through lovely Worcestershire countryside to the first tunnel, at Wast Hills, which at 2726 yards long, is one of the longest in the country. You can moor up near to Hopwood Bridge No. 67, which is close to the Hopwood House, which is an historic pub, in a pretty canal side location. Total cruising today is two miles in one hour. Today's destination is the Black Country Museum, where you can moor up overnight, and spend the day there tomorrow. You might want to stop at the visitor moorings at Bournville (booking is advisable), which is 1 mile North of the Kings Norton Junction, which is signposted from the canal. There is an exhibition dedicated to the history of chocolate, audio visual displays, Victorian Birmingham, and a Jungle to explore. About 3 miles further on, you arrive at the Gas Street Basin, which is in the heart of Birmingham's canal network, and has been redeveloped into a unique experience, where traditional narrow boats moor up next to cosmopolitan cafes and bars. The surrounding area is a vibrant arts and entertainment area, and there are many shopping options within a short walk. Amongst some of the attractions, are the National Sea Life Centre, and the Jewellery Quarter Discovery Centre, also many fine art galleries, and over 500 restaurants, offering every choice of food. For shopping, a visit to the new Bullring is a must, which covers an area the size of 26 football pitches, and a has a huge range of shops. Close by is the National Indoor Arena, one of the busiest, large scale, indoor sporting & entertainment venues in Europe. The Black Country Museum mooring will be your overnight stop for two nights. Your journey here should have taken you just over 7½ hours to cover 18 miles and three locks. The museum is on Tipton Road, in Dudley, and is easily accessible from the canal. There is much on offer at the museum, and spending the whole day here, you will get to see and do many of the activities. The museum stands in 26 acres of former industrial land, and every bit of it is put to great use, in the telling of the creation of the first industrial landscape. Some of the things to do and see are: the Brass Foundry; the Village; Vintage Transport, where you can ride on a tram; Mines; a Traditional Fairground; Fish and Chips; costumed staff to show you around, even a school, where if you are of a certain age, you will remember the lessons, and much, much more. There is a gift shop, cafe, fish and chip shop, traditional pub, and even a Workers' Institute Cafe, serving authentic meals from the industrial era. The list is endless! For details on opening times and ticket prices, visit www.bclm.co.uk, where you will find all you need to know to make your day perfect. You can stay moored here again tonight. Today you will head for Gas Street Basin, just nine miles away. If you didn't stop at Gas Street Basin on Day 2, you might like to moor up and have a look around today (details as above – Day 2). Turn here tonight or in the morning. You have travelled nine miles and navigated 3 locks in just over four hours. From Gas Street Basin, cruise up to the Deep Cuttings Junction, and turn right, where you will soon encounter your first locks, as you begin your descent from Birmingham. The flight of 13 locks are at Farmers bridge. Turn right at the Digibeth Branch, and the Ashted Flight drops through 6 locks, and then left onto the Grand Union Canal. At the Bordesley Junction keep straight on, and do not turn left. There are 5 more locks at Camp Hill. A short walk South West of Bridge 88, is the Birmingham Railway Museum, located over 7 acres, on the site of a former Great Western Railway steam shed. There are 12 Steam locomotives, a Royal Mail van, a 1908 Royal saloon car, and lots of steam railway paraphernalia. By Bridge 84 there is a handy shop for stocking up on provisions. 10 miles and 25 locks have been covered in about 7¼ hours. Today you will head back towards Alvechurch Marina. Cruise down the very rural Grand Union Canal, on its peaceful route southwards, passing through the 5 wide locks at Knowle ,until you reach the Kingswood Junction where you turn right, then right again, onto the Stratford Upon Avon Canal. 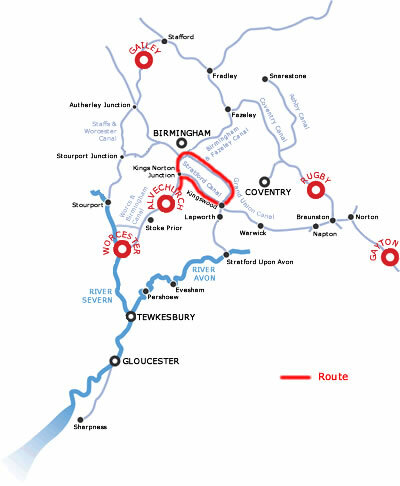 You now need to negotiate an uphill stretch of 18 locks, the Lapworth Flight, which takes you up to Hockley Heath. Packwood House, a National Trust property, is to the North of Bridge 31. It is a timber framed Tudor house, dating from the late C16th. More information can be found at www.nationaltrust.org.uk/packwood-house. Moor up for the night at Hockley Heath, and enjoy a meal and drink at the pub, The Wharf Tavern, and perhaps stock up at the local stores. You have covered nine miles and 24 locks in around 7¼ hours. Today you will cruise back to Alvechurch Marina. Cruise from Hockley Heath, along the Stratford upon Avon Canal, to Kings Norton Junction. At Kings Norton Junction, turn left, and very soon you will return through Wast Hills Tunnel. An hour or so later you will arrive back at Alvechurch Marina. The journey back here will take you around 6¾ hours, to cover 15 miles and one lock. The places of interest and moorings are suggestions only. You are free to create your own itinerary.